On the surface, it might seem to make sense for the President to want to "do something" about climate events such as hurricanes, but there have always been hurricanes and blaming them and everything from droughts to wildfires on "climate change" is not just absurd, it is a deliberate lie that blames a rise in the amount of carbon dioxide, a so-called but incorrectly named "greenhouse gas," as the cause of these natural events. The President has issued an Executive Order to ramp up efforts to address "climate change." 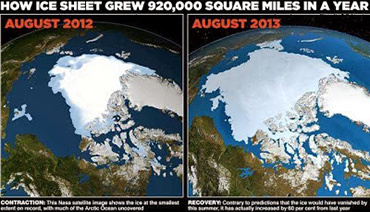 At the heart of the global warming hoax has been this carbon dioxide lie, but there has been no warming for over 17 years and the many computer models that predicted it were wrong; many were deliberately false. When one looks at the actual facts about climate related events, we find that in recent years there have been fewer tornados with a decline of severe tornadoes over the past forty years. There has been more than eight years without a major hurricane strike in the U.S. and the nation has had the fewest number of forest fires for the past three decades. In general, Congress has refused to take up most of Obama's "climate change" agenda, especially his wish for a carbon tax. So it comes as no surprise that he has issued an executive order on November 1st allegedly to get states and local communities to prepare for "the impact of global warming." Perhaps the most curious aspect of this is that states have long had emergency response protocols and other laws in effect that are intended to respond to various climate-related problems. Many communities have plans in place. About the only thing the executive order would achieve would be to layer on more rules that would doubtless come with a higher cost. In a recent edition of Human Events, three prominent climate scientists, experts on forecasting Dr. Kesten C. Green, on the faculty of the University of South Australia; Prof. J. Scott Armstrong of the University of Pennsylvania, and Dr. Willie Soon, got together to write "The Science Fiction of IPCC Climate Change", reviewing the latest announcement by the UN's Intergovernmental Panel on Climate Change. "Global warming alarmists nevertheless claim that the 'nearly all' climate scientists believe dangerous global warming will occur. This is a strange claim in view of the fact more than 30,000 American scientists signed the Oregon Petition, stating that there is no basis for dangerous manmade global warming forecasts, and 'no convincing evidence' that carbon dioxide is dangerously warming the planet or disrupting the climate." Forgive me if I ask you who you believe; three experts on climate forecasting or Barack Obama? The forecast experts debunked the IPCC assertion (and by extension Obama's) noting that carbon dioxide is "a colorless, odorless, non-toxic gas that is a byproduct of growing prosperity. It is also a product of all animal respiration and is also essential for most life on Earth, yet in total it makes up only 0.0004 of the atmosphere." In May 2012, The Economist took note of The Heartland Institute, calling it "the most prominent think tank promoting skepticism about man-made climate change." The Economist has long been an advocate of global warming so this represents significant recognition of the Chicago-based, free market think tank that has sponsored several international conferences on the subject over the years. Anyone who wants to get the facts about the IPCC's continued and relentless promotion of the greatest hoax of the modern era can visit http://climatechangereconsidered.org/ and read "Climate Change Reconsidered II," a Heartland Institute project whose latest edition is a thorough review that debunks the IPCC's misleading "science." As the Human Events article notes, "Other scientists contest the IPCC assumptions on the grounds that the climatological effect of increases in atmospheric carbon dioxide is trivial – and that the climate is so complex and insufficiently understood that the net effect of human emissions on global temperatures cannot be forecasted." Obama's latest executive order, however, is not trivial. It continues the UN's effort to deny access to the benefits of the use of energy worldwide to increase development, provide employment, and enhance the lives of the Earth's population. Obama is gearing up "climate change" as an issue to divert our attention from the many scandals and failures of his administration.